It is the name given to a shallow depression or pit in the roof of the orbit that is situated near the medial margin to which the cartilaginous pulley of the superior Obliquus oculi is attached. 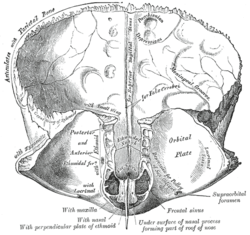 This depression is located close to the nasal section of the interior surface of the frontal bone. Occasionally, it is also situated near a small trochlear spine, for the adherence of the superior oblique tendon pulley. Take a look at this Trochlear fovea photos to know how this physical structure looks like. You can use this image of Trochlear fovea for your reference work.